Stardust, where to get it and how to spend it well. To put this in perspective, a single Pokémon will require 270,000 Stardust to level up from level 1 to 40*. A trainer would need to catch 2700 Pokémon to earn enough Stardust to level up a single Pokémon to max. Unlike Candy, every Pokémon you want to level-up will consume the same dust. For the reasons of high demand and relative scarcity, Stardust is the key resource a trainer needs to manage well. *Note that the current maximum level achievable in game is 40. 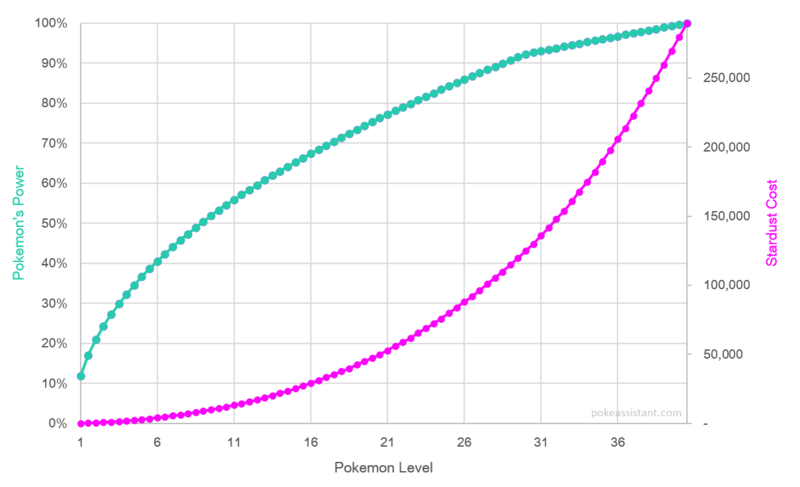 Above we can see a graphical representation of the cost vs. benefit of powering-up a Pokémon. The pink line maps the stardust cost, you can see it rises slowly at the start, then explodes towards to the 270,000 dust total at level 40. Early power-ups cost only 200 Stardust, whereas final power-ups cost 15,000 each. The opposite is true for the green benefit line. Your Pokémon gains the most power early on, and this benefit flattens out to almost nothing by the later levels. The benefit line is a representation of the hidden CPmulti number in the background of the game. This number rises from 0.094 to 0.793 as you level up your Pokémon. It’s this number that determines your Pokémon’s HP, CP, Attack, Defence and Stamina. So as it goes up, your Pokémon gets stronger, but we can see that most of that gain happens early on. The slider above lets you play with the cost/benefit of powering-up. Slide the two points to two different levels and see how much stronger your Pokémon would be going from one level to the other, vs. how much it will cost you in dust to get there. By level 11, your Pokemon is already 50% as powerful as it will ever be, despite only having paid 4.5% of the total Stardust cost. By level 30, your Pokemon is already 90% as powerful as it will ever be, despite only having paid 43% of the total Stardust cost. Leveling a Pokemon from 30 to max level costs 165,000 Dust and only gives a 8.4% gain in power. For this same price you could raise 2 Pokemon from 20 to 30 and each will see a +22% power gain. A level 30 Pokemon with max IV's can be more powerful than a level 40 Pokemon with low IV's. Consider not powering-up a Pokémon unless it has 90% IV’s or higher. Stardust is too rare to spend elsewhere and a trainer may later regret spending this scare resource on lesser Pokémon. It’s almost certainly not worth levelling a Pokémon past level 30. Perhaps if a trainer has a large (20+) team of level 30 Pokémon across a diversity of types with 90%+ IV's, it might then be efficient to select 1-3 to Power up to max level. But for almost all trainers, level 30+ would be a bad way to spend stardust when they could be building a much stronger team allocating the stardust elsewhere. After a trainer reaches level 28, the value of leveling themself any further drops dramatically. At level 28 a trainer can encounter the max level Pokemon in the wild (level 30) and power-up Pokemon to level 30.5. A trainer may wish to allocate less gold toward Lucky Eggs and more gold toward Incubators that produce both high IV Pokemon and large amounts of Stardust. The limited effect of IVs is however based on Niantic's current implementation of battle mechanics, and I would be foolish to suggest that Niantic will never change the mechanics. So whilst the difference between an 80% IV and 90% IV in battle is pretty often zero, just keep in mind that this may not always be the case, and if you enjoy this game, you'll be playing it long enough to get a 80+ or 90+ IV anyway. With all this in mind, picking the right Pokemon to spend your Stardust on is important. If you want to improve your defence, have a look at Najlepsi Obrońcy. If you want to have the best all-round attackers, check out the Attacker tier list.